Could the ballooning rate of sick pets, and a burgeoning multi-billion dollar veterinary industry, relate to the immunocompromising role of feline retrovirus-contaminated vaccines given to millions of animals around the world? Many live attenuated vaccines for animals are manufactured by using cell lines from animals, which are known to produce infectious [endogenous retroviruses] ERVs; however, the risks of infection by ERVs from xenospecies through vaccination have been ignored, and which may contribute to, or cause, serious diseases like cancer in exposed populations. Specifically, the study looked at the potential for contamination of veterinary vaccines with a feline virus associated with leukemia in cats. Given the fact that feline leukemia is the primary cancer diagnosed in cats, the new study may provide a clue to why our pets are undergoing this modern day epidemic. Today’s vaccination manufacturing process, both for veterinary and human vaccines, is still dependent on use of live animal and human cells (diploid, fetal) as master seed stock. In fact, many of these manufacturing processes were developed long before the discovery of reverse transcriptase (1970) and the chemical structure of DNA (1953), making the true risks of using living cells contaminated with DNA and retroviruses unknowable at the time (these include irrevocably inserting foreign animal DNA into a host somatic and germline cells). While so-called capsid or surface antigen techniques, and genetically modified vaccines (which do not contain live cell components) are now replacing these older techniques, presumably in (tacitly acknowledging the safety concerns associated with live cell based techniques), the present-day CDC schedule still contains cell based vaccines (including human fetal cells lines). And the veterinary vaccine market is almost entirely animal cell based. As just one example among hundreds of retrovirus contamination of vaccines, take a look at the history of the rotavirus vaccine. In 2010, the Food and Drug Administration (FDA) convened a panel of experts to review findings that rotavirus vaccines given to infants in the U.S., Rotateq, produced by Merck Pharmaceuticals and Rotarix produced by Glaxo Smith Kline, are contaminated with pig viruses. Rotarix, an orally administered rotavirus vaccine, contained nucleic acids from porcine circovirus-1 (PCV1) virus and RotaTeq has been shown to contain nucleic acids from both PCV1 and PCV2, a pathogen in pigs that is associated with wasting and immunodeficiency. While acknowledging that the entire short and long-term risks from the porcine circoviruses PCV1 and PCV2 are as yet unknown, the advisory panel decided that “the benefits of the vaccine trumps its risks. How Did The Vaccines Become Infected with Retroviruses? The genomic infrastructure of mammals contain a large number of retroviral sequences (~8% of their DNA is retroviral in origin), originated from ancient retroviral infections that incorporated into the species’ germlines, and which became benign or at least completely suppressed (inactive) components of our DNA over the course of hundreds of thousands of years of evolution (a process known as endogenization). Retroviruses are generally harmless, and can be consider co-passengers within the human genome and microbiome. However, these “dormant” retroviral sequences can become active again and potentially harmful when exposed to cells of other species and a crossover event — or “xenospecies infection” — occurs, and they occupy and infect another species. At this point, these ‘resurrected’ retroviral sequences can lead to a disruption of immune function, as well as contributing to benign lesions and malignant cancer (more details on this below in the discussion of feline virus). How Would Such a Crossover Event Occur? Many live attenuated vaccines for animals are manufactured by using cell lines from animals, which are known to produce infectious [endogenous retroviruses] ERVs; however, the risks of infection by ERVs from xenospecies through vaccination have been ignored. This brief review gives an overview of ERVs in cats, the potential risks of ERV infection by vaccination, the biological characteristics of RD-114 virus (a feline ERV), which possibly contaminates vaccines for companion animals, and the methods for detection of infectious RD-114 virus. How did we first come to understand the dangers of xenospecies infection with ERVs? Technical innovation of animal engineering enables us to develop genetically engineered pigs for the purpose of xenotransplanting pig organs or tissues to humans; however, pigs have replication- competent ERVs, termed porcine ERVs (PERVs) . The discovery of PERVs able to infect human cells led to the halt of the clinical trials of xenotransplantation, and the risks of PERVs in xenotransplantation have been investigated extensively. ERVs from AKR mice induce lymphoma in their hosts. An ERV from Asian rodents infected Gibbon apes and induced lymphoma. A retrovirus emerged in koalas in Australia about two hundred years ago, and endogenized. The virus, named koala retrovirus, induces neoplastic diseases and immune suppression in the new host. In humans, a novel gammaretrovirus was discovered recently in patients with prostate cancer. This virus was closely related genetically to the xenotropic murine leukemia virus (X-MLV) and designated as xenotropic murine leukemia virus-related virus (XMRV). In the veterinary science area, at least mice, pigs, cats and chickens have infectious ERVs. Many live attenuated vaccines for animals are manufactured by using cell lines from these animals. 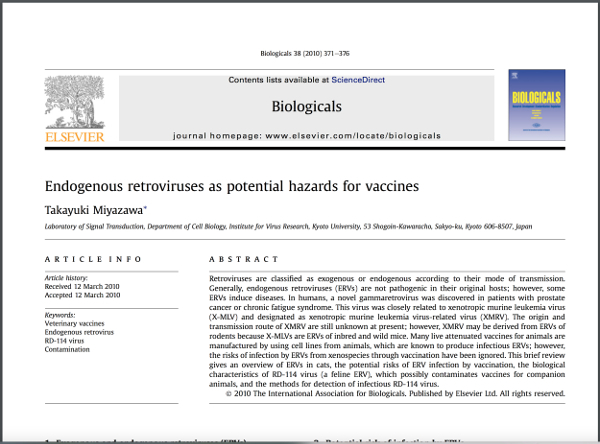 In addition, several live attenuated vaccines are manufactured by using cells which are known to produce infectious ERVs; however, the risks of infection by ERVs from xenospecies have been ignored. 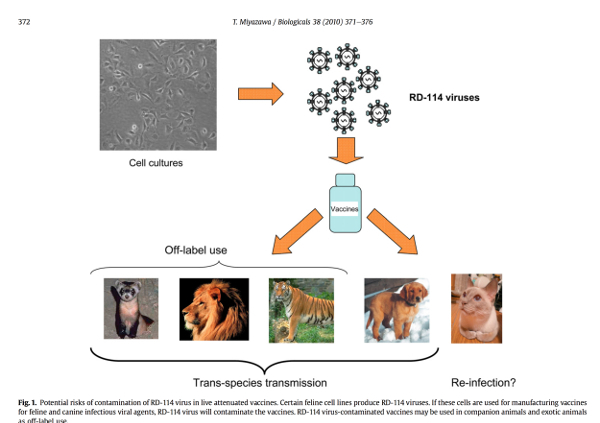 The RD-114 virus is of special concern because is found within a wide range of vaccines for canine vaccines, as well as “off label” use in zoos for other exotic animals, and is of course also potentially re-infecting cats whenever administered to them. RD-114 was first isolated from a human tumor cell line (RD cells) derived from a human rhabdomyosarcoma after passage through fetal cats, and is thought to be xenotropic, i.e., RD-114 virus does not productively infect feline cells. However, RD-114 virus is known to infect several feline cell lines [1,4] in addition to cell lines from xenospecies such as humans and dogs; therefore, RD-114 virus is polytropic, but is not strictly xenotropic in vitro. In human cell lines, RD-114 virus interferes with BaEV, simian retroviruses 1, 2, 3, 4 and 5 (primate betaretroviruses), avian reticuloendotheriosis virus, and duck spleen necrosis virus; therefore, these retroviruses are considered to utilize the same receptor in human cells. In 1999, two groups independently identified the receptor for this large interference virus group [13,18]. As long as feline cells are used to produce vaccines, there is a risk that infectious RD-114 virus contaminates live attenuated vaccines. Because RD-114 virus productively infects cells from cats and dogs, the virus can infect these animals in vivo. Since certain ERVs infect new host species and induce diseases, the potential risks of infection by ERVs in humans and animals should be reconsidered. Recently, we developed a sensitive assay system, LacZ marker rescue assay, to detect infectious RD-114 virus. We are currently investigating the presence of infectious RD-114 virus in commercial live attenuated vaccines for companion animals. In conclusion, our study suggests that the presence of infectious ERVs should be taken into consideration when assessing the purity of live attenuated veterinary vaccines. The methods currently employed to screen veterinary vaccines for retroviruses need to be reassessed. Studies have looked at the potential for feline ERVs to ‘jump’ across the species barrier to humans, and the findings while inconclusive, do not rule out this possibility. It is believed that co-inhabitation can lead to cross-species infectivity between pets, pests, and humans, which is something that has been theorized to account for the presence of mouse mammary tumor virus in malignant human breast cancer, as well. Though I think its an equally likely explanation that the MMTV crossover event between mice and humans could be related to laboratory, vaccine, or biological medicine related contamination. Indeed, the problem of vaccine contamination, as well as other biologicals, is widespread. 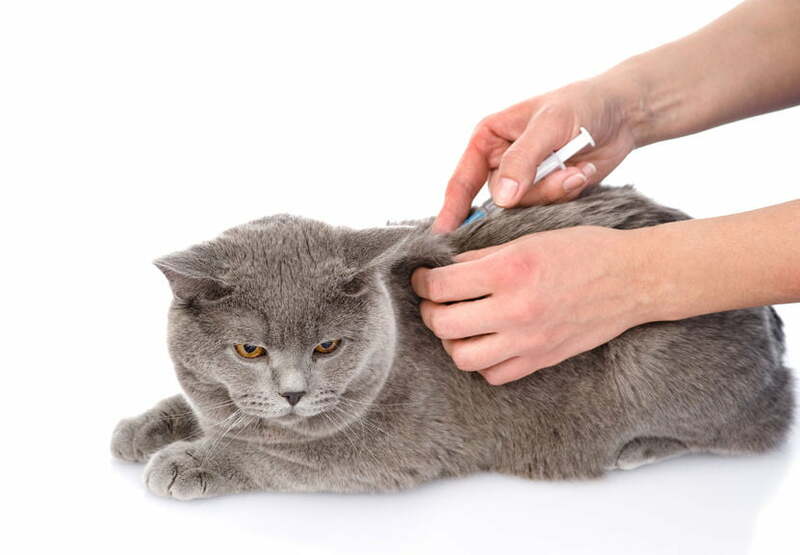 Recently, Japanese and UK research groups found that several feline and canine vaccines were indeed contaminated with infectious RD-114 virus. This was the first incidence of contamination of ‘infectious’ ERVs in live attenuated vaccines. RD-114 virus replicates efficiently in canine cell lines and primary cells. Therefore, it is possible that RD-114 virus infects dogs following inoculation with contaminated vaccines and induces proliferative diseases and immune suppression, if it adapts to grow efficiently in dogs. In this review, we summarize the incidence of contamination of RD-114 virus in live attenuated vaccines and potential risks of infection with RD-114 virus in dogs. In previous studies, it was reported that MMR vaccines (measles, mumps and rubella vaccines) and yellow fever vaccines that were propagated in chicken embryos were contaminated with endogenous avian leukosis viruses (ALVs) and endogenous avian retroviruses (EAVs), which originate from chicken embryonic fibroblast substrates [16, 45]. The truth is that any vaccine produced through animal, insect, and even plant cells, carries a risk for surreptitious viral contamination with endogenous retroviruses. The fact that present-day vaccination manufacturing processes were developed before the discovery of reverse transcriptase, helps to explain how such a profound lack of oversight and understanding of retroviral contamination is operative today within the global vaccine agenda. The safety issues, which could not have been foreseen at the relatively primitive state of scientific learning that the founders of modern day vaccinology and immunology were at, continue to haunt those both at the giving and receiving end of vaccination programs. Thankfully, the research is finally coming into the light of day. 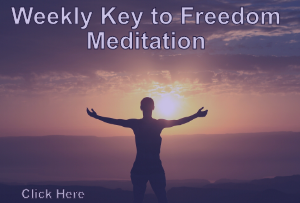 To learn more about this issue, listen to Judy Mikovitz discus her work on the topic by listening to our interview on Fearless parent. Yes Carla, rabies only. I live in the rural mountains and have had all kinds of animals for my entire 60 years. All of a sudden I have a fat unhealthy cat? Also my dog before she died had a couple years of unhealthy reactions to the shot regimens now given to animals. I know what I know … and so do most of us…. listen to your heart’s advice. People are getting sicker now, dying younger, and we are not being told the truth about this. And who is there right by our sides? Of course, collateral damage … right? There is a silent war being waged against us. We are boiling frogs … and they’re sick too. 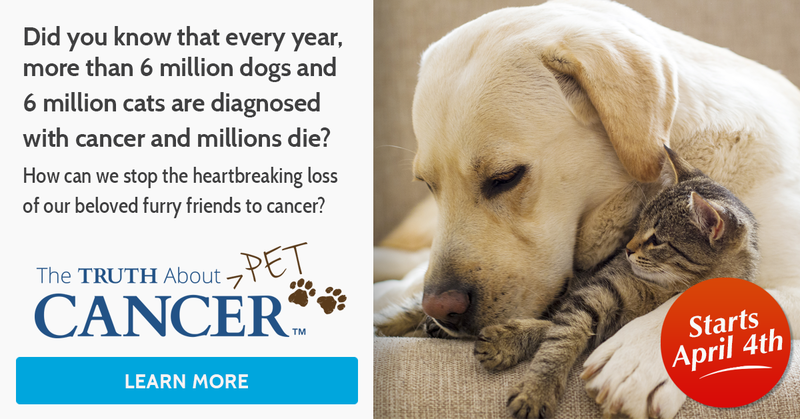 God, I knew this was happening when my feline girl came down with a rare form of cancer found in dogs. She lived through the 2007 Chinese “protein” poison in pet food and then I lost her any way. I just refused vaccines for a new rescue but they talked me into the one for rabies against my inner voice saying no. Glad I refused the others.